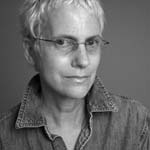 Former STUDIO Associate Fellow Charlee Brodsky is a professor of photography in the School of Design and a fine arts and documentary photographer. Brodsky describes her work as dealing with human issues and beauty through everyday tales of life. Her work on mental illness is being exhibited at mental health conferences and will be published as a book entitled Of Anguish, Compulsion, and the Blues in the spring of 2008. Her book Street, with poet Jim Daniels, won the 2007 Tillie Olsen Award given by the Working Class Studies Association. In 2001, she and three others won an Emmy for their work on Stephanie, a video documentary about Stephanie Byram’s life with breast cancer. Her photographs of Stephanie were also featured in the bookKnowing Stephanie, which was one of the American Association of University Presses’ outstanding illustrated books of 2004. With anthropologist Judith Modell Schacter, Brodsky explored Homestead, a former mill town. This work resulted in the book A Town Without Steel, Envisioning Homestead. Brodsky continues to walk Homestead streets, this time with writers Jim Daniels and Jane McCafferty. In addition to teaching and photographing, Brodsky was a guest curator for many years at the Carnegie Museum of Art in Pittsburgh where she curated exhibitions dealing with photography of western Pennsylvania. This work culminated with the exhibition and book Pittsburgh Revealed, which she curated with Linda Benedict-Jones. Brodsky holds an MFA from the Yale University School of Art and a BA from Sarah Lawrence College.